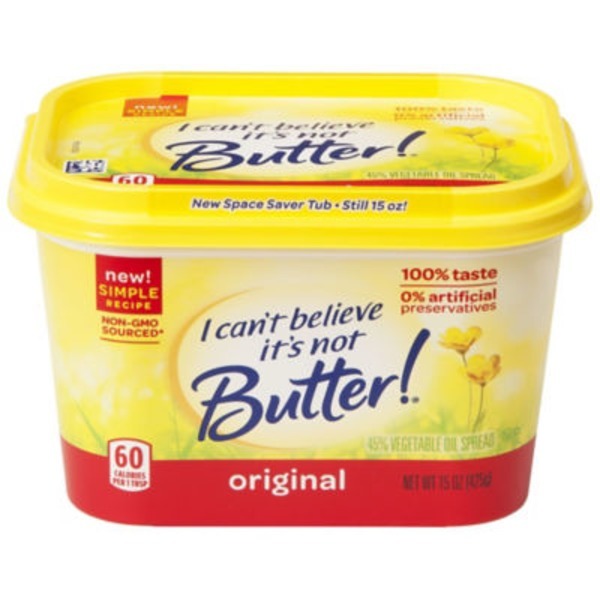 I Can't Believe It's Not Butter! Original offers fresh butter taste with no artificial preservatives. It is made with simple, Non-GMO sourced* ingredients like a delicious blend of oils, purified water, and a pinch of salt. This irresistibly creamy spread contains no artificial flavors, no artificial preservatives, and 0 g of trans fat per serving. *We source ingredients that are not genetically modified. However, in the field-to-tub journey of making our buttery spread there is some contact with genetically modified vegetable oils, resulting in a small amount in this product. See our website for more information. Purified Water, Soybean Oil, Palm Kernel and Palm Oil, Salt, Lecithin (Soy), Natural Flavors, Vinegar, Vitamin Apalmitate, Beta Carotene (Color). Contains Milk and Soy.